Watch "The Science Behind BackHealth"
Do you know the truth about back pain? The truth about back pain is this: Over 95% of all back pain can be tied to dysfunctional spinal musculature. One of two muscular possibilities exists in your back-pain case: 1) Either your spinal muscles became weak and/or uncoordinated from being sedentary, allowing your spine to become injured with a twist or pull for which it was unprepared, or; 2) Following injury or surgery, your spinal muscles weakened further due to a sedentary period of healing. In either or both cases, fully healing your spine requires that your spinal musculature be re-strengthened and re-coordinated in lift dynamics, and done so to a measurable point. Since spinal-muscle dysfunction affects virtually all back-pain cases, a spinal-exercise system had to be developed to answer this need. The BackHealth™ System answers this need, and does so with genuine results. Once your medical professional calms the pain generator in your back, it is up to you to do the rest. No pill, no surgical procedure, and no spinal adjustment can return your spine to lasting, pain-free performance. Only you can do that. With the exception of direct trauma, whatever took your spine to failure in the first place will take it there again, unless, of course, you change things. The BackHealth™ System lets you changes things, breaking you out of the back-pain trap and keeping you out of it forever. Practical thinking among some of the best minds in spine care incorporated the bio-mechanical underpinnings of spinal function into an effective spine-healing routine and device. The device—the BackHealth™ Exerciser—is lasting and designed for use in your home, apartment, or office. 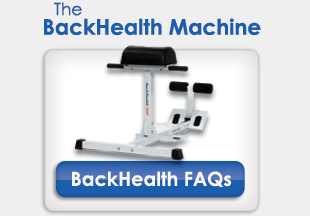 To understand how the BackHealth™ Exerciser works, review “The Science Behind BackHealth™” tab on this website. Question: How much is a healthy spine really worth? Attention Doctors: Please place your BackHealth Exerciser machine orders by phone. If you are not currently in our database, please call and we will register your clinic. Upon hearing the words degenerative disc disease or degenerative disc, most people picture some sort of pathogen attacking one of their spinal discs. This is not the case. A degenerative disc is simply one that is breaking down because the muscles upon which it depends for support no longer have the strength to properly support and protect it. The disc may also be suffering from lack of nutrition. In an overwhelming percentage of cases, the degenerative process can be reversed by simply strengthening spinal muscles and expanding the disc to its original thickness. How can this be done, exactly? Find out how to cure degenerative disc disease! If you are not completely satisfied with your results, Return your BackHealth Machine in it's original condition and get a full refund! No questions asked! New Body - New Life! The BackHealth machine coupled with a good diet can speed up results. Don't waste your time and money on fad diets. 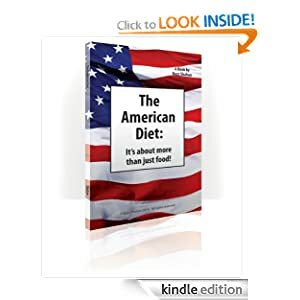 Check out a tried and tested simple way to live healthy by visiting Amazon.com to get your copy of The American Diet.